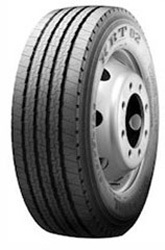 KRT02 Longmark tyres are the best choice of tyres for heavy vehicles that make long journeys regularly. The tyre construction needs to be able to handle the heavier weight as well as accommodate how heavy any load will be for the entire journey. Marshal rigorously test all their tyres to make sure they have the only the most reliable tyres you can rely on that will last for a long time, proving them to be exceptional value at an unbeaten price. Don’t miss out on KRT02 Longmark tyres.